Resources: cultivar registration - encyclopedias - conservation - plant identification - Virtual Arboretum - nursery catalog links - Cultivar-TV NEW! 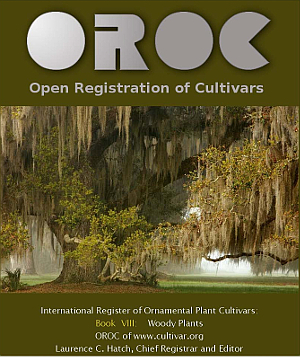 All OROC cultivar registers are 100% free! registers (out of three planned) now cover 114 pages of detailed information and high quality images. 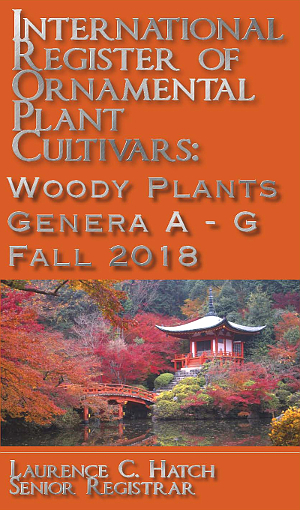 52 pages of new cultivars from Abelia to Gymnocladus. Use OROC Book 8.1 linked below for other genera. Genera H to N will be updated for Winter 2018. Click link above or image below to download. This volume is also available fro Google Play Books. Click link above for 77 pages of the newest perennials you may want to grow or know about. available elsewhere in print or the web. 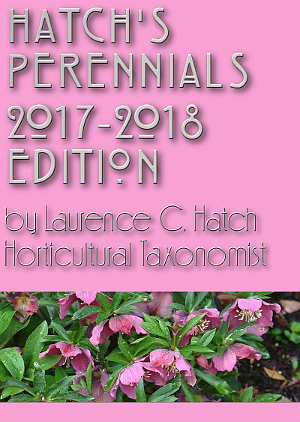 Find out why CWP remains the "go to"
Hatch's Perennials 2018-2020: new totals: 58 Iberis, 39 Juncus, 185 Opuntia, 65 Origanum, and 108 Nepeta cultivars. Hatch's Perennials 2017-2018: now 68 Baptisia, 81 Bergenia, 21 Brunnera,362 Campanula, 56 Dicentra, 35 Disporum, 193 Geum, 121 Mentha, 192 Miscanthus, 162 Monarda, 297 Sedum,146 Veronica, and 97 Yucca cultivars. 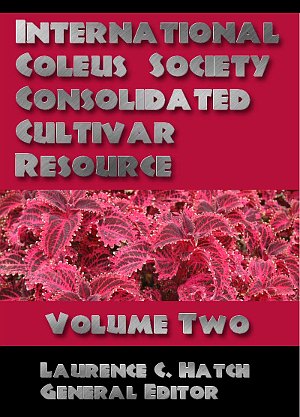 Cultivar.org Databases - all volumes accessible from a single online or downloadable menu. More than 50% cost savings over buying individual volumes. This option is designed for either a private or public interface. Looking for Pinetum Novum? 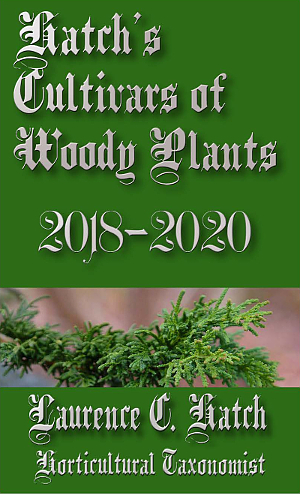 This series of conifer files is now included in Hatch's Cultivars of Woody Plants. Hundreds of biographical sketches on leading developers of the modern landscape ornamental plants in general, covering botanists who found them, nurserymen who refined and distirbuted them, taxonomists who defined them, plant breeders who improved them, designers and architects who made them art, authors, educators, popular "gurus", noted collectors and other special folk who made our gardens so much better. High-res images of their works are included. find all the volumes on this shore. Now it's free. see Carr. after a name? That's him. This was one of the most widely distributed nursery guides in the US and from the great one himself. I've always liked calling propagation by his terms of seedage, cuttage, and graftage. 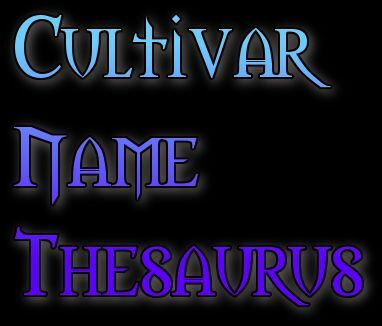 It seems so proper and academic.Bailey invented the word "cultivar" and conspired to be a "horto-botanical" writer, meaning that both horticulture and botany were blended into the whole. By the way he did all this while Dean of the College of Agriculture at the Ivy League Cornell University. Best nursery websites for general ornamentals cultivar info. Refer to GENUS CENTRAL™ MAIN FILES for the best genus-specific nurseries and collector websites. is an external site but one we very highly recommend. endangered garden varieties of plants. Taxa Range: all temperate woody plants including trees, shrubs, conifers, vines, hardy palms, and subshrubs. $49.00 - $89.00 per user from Cultivar.org and a menu you can put on your phone, tablet, laptop, or any other internet-enabled device. Click Buy Now from our Paypal checkout site after selecting the Number of Users from the pulldown menu. MORE DATA: more cultivars than everywhere else, more than 2500 PDF 8x10 in. pages and over 380 megabytes. No print publisher would every comprehend sending out this much information. This is only doable and affordable as digital ebooks. AUTHORITATIVE: Horticultural taxonomist Larry Hatch (BS Cornell, MS NC State) has worked on this and collected perennials for more than 35 years and had more than two decades of expert advice from the New Ornamentals Society. VERSATILE: you can put the entire system on your phone, tablet, laptop, desktop, ebook reader, and other device - anything that reads PDF files. More than 480 devices are supported. EVERYWHERE YOU GO: you have this data wherever you carry your devices in the garden, nursery, botanical garden, classroom, lab, or your client's office. YOU OWN IT FOREVER IN SECURE DIGITAL FORM: If you download the PDF files on your own devices, you have them forever as long as you keep the password (please do). If you decide to purchase updates from our 2018 and future editions, it's up to you to decide when and if you do. ORIGINAL AND EXCLUSIVE: unlike some popular perennial books this is not a crude "compilation" with the pooled ignorance of random interest users unfiltered by experts. 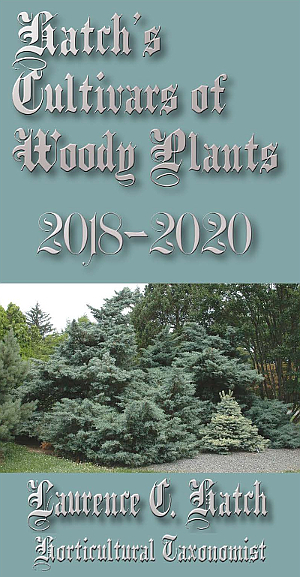 HP2016-17 contains decades of original real garden, literature, nursery catalog, and plant trials research. Thousands of observations and data points are exclusive. FREE UPDATES: does your old perennial book author and publishers send you free updates and supplements every month or so? We're guessing...no! We will. You get all the new data and updated files through December 2020 at no extra charge. Your subscription lasts that long. CULTIVAR SPECIFIC DATA: we are very detailed on individual cultivar heights, habit, color, origins, history, leaf traits, and more. OROC SUPPORT: not only does this work plug into all the new perennial cultivar registrations of the Open Registration of Cultivars project but you subscription directly funds that project. There is absolutely no other organization actively and assertively cataloging new hardy plant cultivars with peer-reviewed standards. ACADEMIC, SCIENTIFIC QUALITY: we include literature citations, university cultivar release notices, expert trial reports, screen prints of classic old catalogs and literature, identification tips, taxonomic notes about related formae, varieties, and subspecies. NO SHIPPING OR CURRENCY CONVERSION COSTS: with our digital delivery you save on handling, packaging, and postal costs. We can't do anything about local taxes. Currency conversion from over 100 countries is usually free and in the old days that could add $8-30 to our orders. Occasionally we pay 30-70 cents and we "eat that" with no worries. YOUR FEEDBACK MATTERS: Mr. Hatch insists on personally receiving and taking action with permission on submissions from all users, including your own new cultivars, images, your observations, comments, corrections, and anything else you can to share. 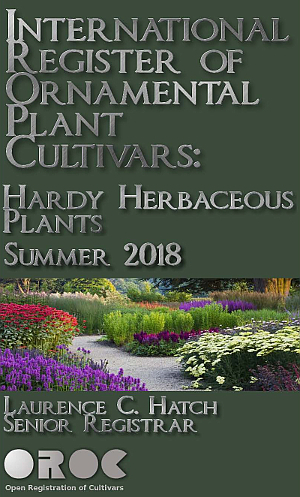 Hundreds of past readers of Hatch's Perennials have sent images and new cultivar descriptions as well as interesting plant histories that became part of this worldwide, shared resource. This subcription is 100% digital delivery as PDF files and there are no mailed or printed materials. You will receive a download website page address/URL and password by email, usually within 48 hours of your order, to access your new resource. THIS IS NOT A PRINTED BOOK and we do not mail any content. This is a 100% digital service. If for any reason Paypal decides to delay, hold, or verify your order, we are required to delay this information until the payment is confirmed. We may not be paid if you have any existing holds or "open cases" with Paypal. Write us at ornamentals@lycos.com if you need to pay by another method. If you Paypal email address is outdated we will have no way to reach you. Please update that website or send your order data to ornamentals@lycos.com with the correct address without delay. MORE DATA: more cultivars than everywhere else, more than 1000 PDF 8x10 in. pages. No print publisher would every comprehend sending out this much information. This is only doable and affordable as digital ebooks. 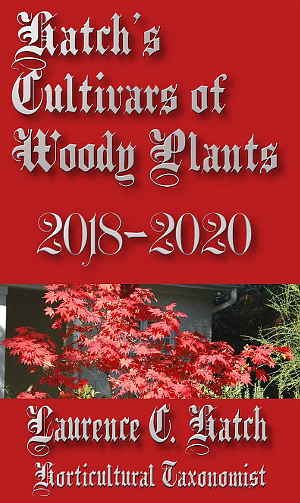 AUTHORITATIVE: Horticultural taxonomist Larry Hatch (BS Cornell, MS NC State) has worked on this and collected perennials for more than 30 years and had more than two decades of expert advice from the New Ornamentals Society. DIVERSE GENERA: Interior Plants not only covers classic cultivars of houseplants, tropical interior plants, and tropical bedding plants but also tender bulbs, Coleus (1500+ cultivars), 500+ Hedera, and a searchable database to the best 2000 Saintpaulia cultivars. WHAT IT'S NOT: HIP is not a botanical treatise on the species of tropical plants, their identification, and garden culture. It is a richly imaged encyclopedia focusing in on cultivars and comparisons to their own species. YOU OWN IT FOREVER IN SECURE DIGITAL FORM: If you download the PDF files on your own devices, you have them forever as long as you keep the password (please do). If you decide to purchase updates from our 2020 and future editions, it's up to you to decide when and if you do. ORIGINAL AND EXCLUSIVE: unlike some popular house plant books this is not a crude "compilation" with the pooled ignorance of random interest users unfiltered by experts. This system contains decades of original real garden, literature, nursery catalog, and plant trials research. Thousands of observations and data points are exclusive. FREE UPDATES: does your old book author and publishers send you free updates and supplements every month or so? We're guessing...no! We will. You get all the new data and updated files through 2020 at no extra charge. Your subscription lasts that long. AMAZING, SCREEN-WIDE HIGH-RES IMAGES: from the very beginning Mr. Hatch insisted we publish huge 900 pixel wide images with clarity and lots of digital SLR detail. 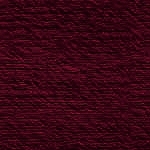 Today our standard is 1250 pixels wide. No print book publisher could give hundreds of these big, ultra high quality pictures for less than hundreds of dollars in coffee table type books. THIS IS NOT A PRINTED BOOK and we do not mail any content. This is a 100% digital service. But like a printed book if you download the files and save them, they are yours to keep forever. YOUR FEEDBACK MATTERS: Mr. Hatch insists on personally receiving and taking action with permission on submissions from all users, including your own new cultivars, images, your observations, comments, corrections, and anything else you can to share. This subscription is 100% digital delivery as PDF files and there are no mailed or printed materials. You can view and download the files from the menu page or save the menu plus all the files to your local device for quicker loading. Do it online or from your local harddrive or both! Once you complete your order, you'll be taken to a page that gives instructions where to find the menu and password. When we get Paypal's confirmation email in our box (and that may take 1-2 days), we will followup with an email containing the same information. Please keep a copy of your password. If for any reason Paypal decides to delay, hold, or verify your order, we are required to delay this information until the payment is confirmed. We may not be paid if you have any existing holds or "open cases" with Paypal. To order select the number of users from the pulldown menu and press the Add to Cart button. Paypal will handle the rest for us.